Kansas Public Radio, www.kansaspublicradio.org, features weekly live broadcasts of select IIYM students from their station’s studio on the University of Kansas campus. Radio appearances feature interviews and performances. Students also perform at the Theather Lawrence, www.theatherlawrence.com, Lawrence Arts Center, www.lawrenceartscenter.com, and private residences in the Lawrence, Topeka, or Kansas City community. 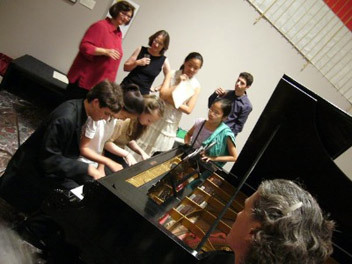 Students are selected for community performances at the discretion of IIYM faculty and staff. Students stay in a KU campus dormitory, a two-block walk to the music building. Dorm rooms house two students to a room. Breakfast, lunch, and dinner are are served daily in the cafeteria and meals are included in the tuition for students staying in the dormitory. Public common areas in the dormitory allow for coed socialization, but private rooms are strictly male or female. Laundry facilities and pay phones are available for student use in the dormitory. Students under the age of 18 are supervised by a staff of qualified IIYM counselors. The student to counselor ratio is 10:1. IIYM counselors are always present at all facilities in use by IIYM students including the music building, dormitory, and any performance venues. Students are not permitted to leave campus without staff or faculty supervision. In addition to IIYM staff, KU Public Safety, www.ku.edu, ensures a safe environment on campus for all IIYM students. All applicants must submit a good-quality video via Youtube link. If you have problem to access Youtube, you can upload to other websites, such as youku.com, QQ. Once uploaded, email the link to chung@iiym.com.